The automatic response to that question is (or should be) - ‘the right time for what?’ To book flights to Paris? To plant tulips? Trying to guess what the right time is without all the information available is almost always ineffectual, and sometimes downright risky. When it comes to retargeting lapsing app users, trying to come up with a one-size-fits-all timing would be like trying to find the answer to life and coming up with 42. Not only is the optimum moment to re-approach unique to each app, it’s unique to each type of user. With 90% of people who download an app abandoning it within 30 days, vague attempts at re-engagement are simply not enough - however, all is not lost the moment that they start lapsing. 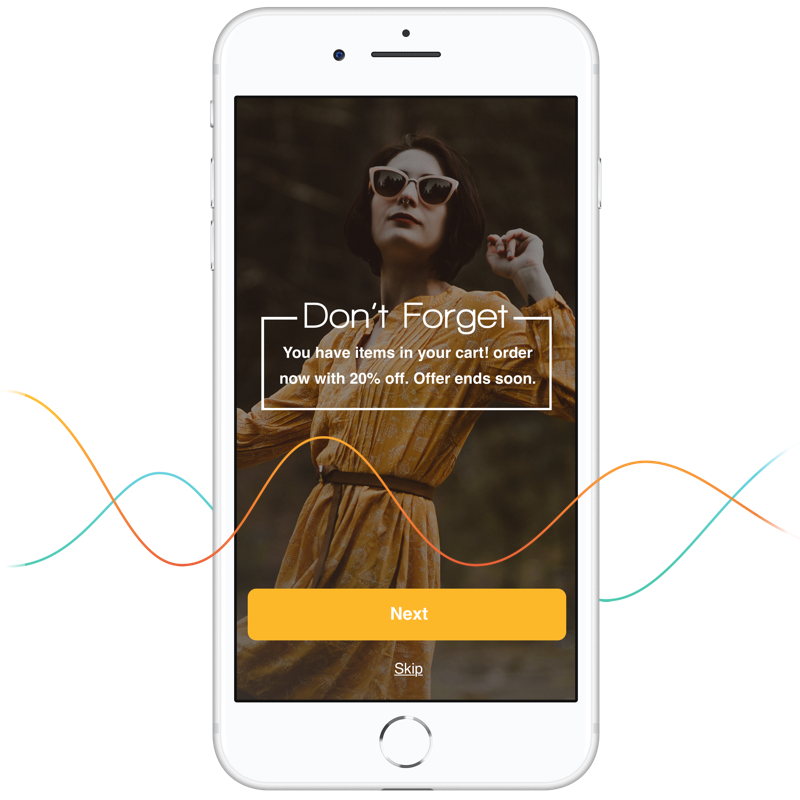 Reconnecting with users who have previously engaged with the app means that you already have the data needed to approach them in the most compelling way, and at the most compelling time. Finding what works for your app and applying it to campaigns effectively can mean the difference between a user returning to make a purchase, and them hitting ‘uninstall’ instead. Regular readers of the Swrve blog will have seen our article on how retaining existing users leads to far greater ROI than a focus on driving acquisition. Similarly, retargeting to existing users who have started drifting away can be highly effective if done well. The classic case study in this area is cart abandonment. Studies suggest that as many as 58% of users have abandoned a mobile purchase before checkout, which stands to reason when you consider just how distracting any given five minutes on a mobile device can be. But carefully curated prompts by email or push notification can remind users of the product they were looking at, as well as maybe offering a discount, gently moving them towards to completing the transaction. One Swrve retail customer increased conversions by 15.8% through implementing abandoned cart recovery messaging. However, it’s not just what you say and how you say it that matters - when you say it needs to be optimized too. Sending retargeting messages too soon or too frequently is likely to become pure nuisance, or, at the least, teach users to ignore them. On the other hand, reminding someone about a cart they abandoned two months ago is unlikely to bring any benefits either: if the user was really going to purchase those products, by this point they will have bought them somewhere else. With so many variables at play, here’s a few simple tips that should set you on course for perfect timing! The point at which a user’s natural absence periods end and churn begins is influenced by average frequency of use. 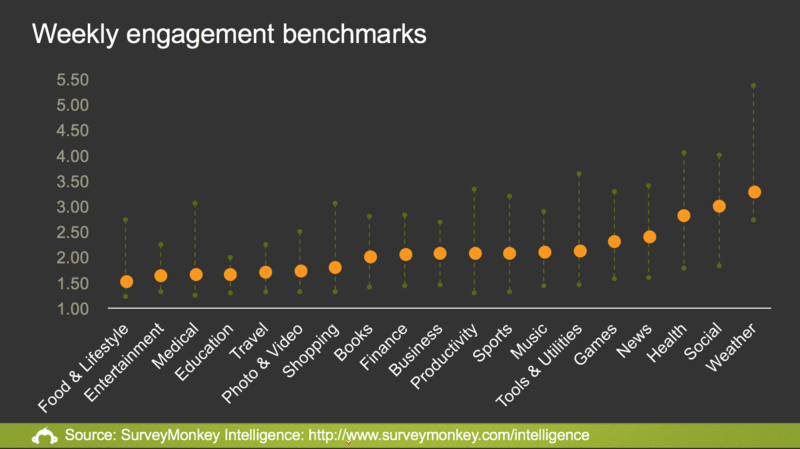 The SurveyMonkey chart below highlights how much this varies between different kinds of apps, from Food and Lifestyle with 1.5 engagements per week, to Weather with nearly 3.5. Starting out with an understanding of how often you can expect to see your users helps you detect when they stay away longer than usual. Attempting to retarget users before the natural return time won’t bring any more sales, and if you’re using discounts as part of the retargeting, it’s money spent without adding value. If the real issue is that regular users aren’t spending enough time in the app, it might be a case of reassessing your user experience, rather than retargeting. Average number of days per week a mobile app is used. Orange dots represent the median value for iOS and Android apps. Green dotted lines show the 20th and 80th percentile value. A thorough analytics programme is one of the biggest assets you can have when it comes to effective retargeting. Looking back at the chart again (although I’m sure none of us need reminding), it’s obvious that users are a very varied bunch. Taking the example of Social apps, engagement as low as 1.5 and as high as 4 days per week is all fairly normal. With the right analytics package (one that goes beyond basic aggregated numbers), it’s possible to get a more granular picture of your users and thus target them more specifically. Segmenting users by the frequency and recency of their engagement with the app means that you can create a different retargeting plan to suit each group, or indeed each individual. It is a truth universally acknowledged that personalization helps improve customer relationships, and this in turn helps improve customer retention. When it comes to timing, this means automating push notifications to be sent at the time when each individual user will be most likely to respond based on previous use. After all, no one likes being disturbed in the middle of the night - unless, of course, they work night shifts and do most of their mobile gaming at 3AM. Personalization also means taking note of specific user events. If Amy uses the app to book a hotel for July, you know that letting her know about a room upgrade option two weeks before maximises your chance of reopening that conversation. Even once you’ve nailed down optimum timing, the type of notification you’re planning to send can also influence when the ‘right time’ is. If your retargeting message involves a discount or offer, and therefore has a cost implication, it’s wise to err slightly on the side of caution. As a rule of thumb, taking action after the normal user return period has doubled means that you avoid wasting resources on users who were going to return anyway. If, on the other hand, your planned push notification or email doesn’t have a cost implication, getting in touch sooner rather than later can avoid significant drop offs - around 20% per day once the regular use pattern has been broken. 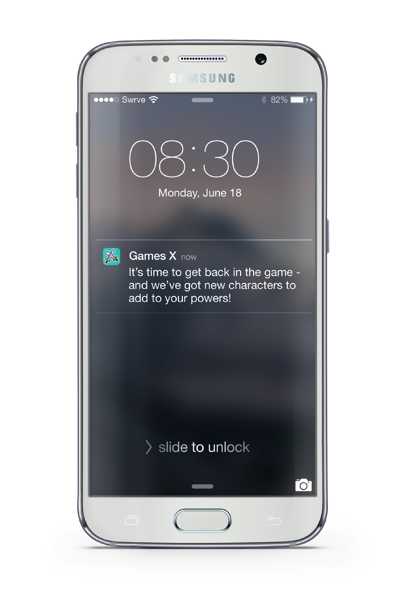 Wait too long and the effectiveness of push notification campaigns is limited at best. With all those elements taken into account, it’s time for A/B testing. Trying a few variations on when retargeting occurs and tracking the success rates of each can give a much clearer picture of what people are responding to best. Testing elements with even the smallest levels of difference allows you to identify areas for improvement before they can do damage to your user retention rates.